The Patricia Grand is here to make your vacation dreams a reality. The beautiful property is located in the heart of Myrtle Beach and offers 1 bedroom efficiencies and suites with stunning ocean views. FREE Daily Hot Breakfast is included with ALL stays! Rooms include fully equipped kitchens and appliances, private balconies and free wifi. If you just can’t leave your dog behind ask about their great pet-friendly options. You’ll love the heated oceanfront pool with seasonal pool bar, and the large indoor pool and hot tub make even rainy days fun. Kiddos have their own pool and are sure to spend hours in the lazy river which is enclosed in the cooler months. There are plenty of extra perks to check out while staying at The Patricia Grand like the onsite gift shop, coffee bar and fitness center. Grand Central Station Restaurant and Lounge can be found on the second floor and serves breakfast, lunch and dinner. The resort offers so much you may not even want to leave. If you do decide to venture out, the downtown location is only a few minutes away from Broadway at the Beach, the Myrtle Beach Convention Center, SkyWheel and much, much more. Rooms at this popular Myrtle Beach resort fill up quickly so reserve yours today! Free Daily Breakfast with All Stays! When you first walk in the night front desk workers was extremely nice and helpful. The lobby has a big Chandelier hanging with seats on the second story that you can sit at. There's a lazy river and a big hot tub that doesn't feel as hot as the other side of the hotels hot tubs where the indoor pool is at. When you go up there's a little design that's cut out that you can look down that looks kinda like a shell. Upon reaching the rooms they smelt clean the bathroom looked clean. The balcony is big enough they have two chairs on that you can look out and see the outdoor pool and the beach. The bed wasn't as comfy as I would like nor where the pillows. The room is kinda simple but, I would stay again. Wonderful staff, especially Kathy! She greeted us with a smile and a personal word every time we passed the front desk! We enjoyed the large refrigerator in our room and invited our son, daughter in law and kids over for birthday cake! The kids loved the pool and we enjoyed the hot tub! We walked on the beach and hunted for sharks teeth. A fabulous vacation! Thank you, Patricia Grand! A very nice stay overall. Great beach view. Super convenient location. Very clean rooms. Terribly tight parking deck. Front desk was nice but seemed very confused about the four rooms our family leased for the weekend. We got it straightened out. We’d come back! Nice staff. They seem to be a friendly bunch top to bottom. Despite the enormous amount of dogs in this pet-friendly place it was relaxing except for one morning when the room next to us had a small dog that barked nonstop. We had to switch rooms that morning anyway due to a malfunctioning toilet. They upgraded us which was nice. Bigger room and better view of ocean. Rooms were clean and we felt comfortable in them. We couldn't sit out on the back deck because there was window cleaning or something going on with a big lift. There is a huge window on the second floor beside the restaurant we enjoyed sitting at and reading books. Wonderful place to visit. Great views of the beach. Friendly staff. Pet & Kid friendly. Great location for a holiday stay in Myrtle Beach to visit local family. Check-in was easy. Staff super-friendly. Our room was perfectly clean. Breakfast was delicious. I wish it was warm enough for a swim in the pools. We would stay here again! My boyfriend and I went to the hotel for the night just to have a little get away. The room was amazing, everything we wanted was in the room! Great views of the ocean! The only con that I had at the hotel was that we were not able to get the free breakfast because we did not book direct with the hotel, we booked from booking.com and because of that we were not able to have the free breakfast. Everything else was great! I will definitly be back!! We had a mishap and had to find a place to stay quickly. The Patricia Grand had a great last minute rate. Lynne at the front desk was fantastic. The room we were in had an amazing view of the beach. The room was clean and comfortable. Would definitely stay here again. We love this place! We originally booked a much lower quality hotel here on the strip but are thrilled with the amenities and services of this resort. 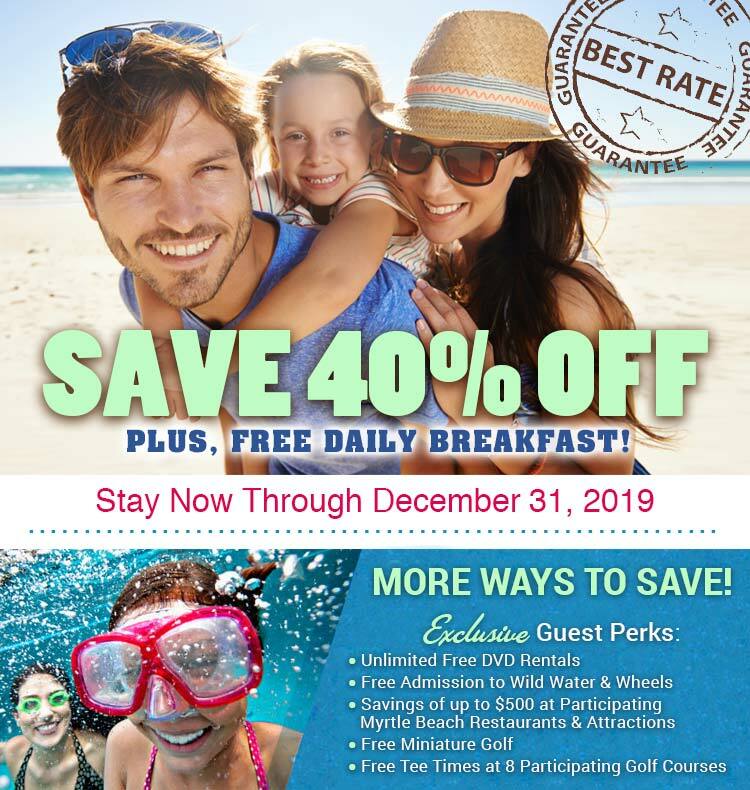 The value is incredible; free breakfast, mini putt and dvd rentals! The best part by far is the staff. Our servers Stacey & Darnell at breakfast were the epitome of southern hospitality! Drake at the front desk was probably the best hotel associate we’ve ever been helped by in many years of traveling. He was very knowledgable, kind, patient and so accomodating! We could really tell he is a very hard worker. All in all we couln’t ask for more. Highly recommend! Awesome time. Clean unit. Pools clean. Great customer service. Very helpful front desk staff. Lots of fun. In the middle of everything. Great food at the bar. Great mini vacation/business trip. The indoor pool and lazy river was awesome. When we walked in we were leery about the massive line... lol and behold it only took 25 minutes!! After that everything else was perfect! It's so welcoming to pets and kids (we are on our honeymoon but still enjoyed the happy atmosphere!) everyone I saw worked constantly and with a huge smile ! Our room was soooooo clean and everything was updated and freshly painted! Even housekeeping was so friendly and funny!! Our balcony made the whole trip worth it! Even though it rained everyday there was still plenty to do with all the perks from Patricia Grand!! We will DEFINITELY BE BACK!! From start to finish, our stay was a great experience. The entire staff went out of their way to make sure we felt at home. We spoke with many of the other guests during our visit and enjoyed getting to know them. The location was convenient to area attractions and the free breakfast buffet was an added bonus! The kids enjoyed the pools after a day on the beach and loved ending their fun filled days with a free movie rental located in the lobby. The hotel has a great dog area for your pet and welcomed our dog Lucy with open arms. We saw lots of other dogs who were well behaved and the hotel did a great job of keeping everything clean. We will definitely stay again! Staff were friendly and kind. Room was clean and very nice. Can't wait to go back. They have rooms that are pet friendly and these rooms were clean and nice. I took my little puppy and will go back with her again! Although, It was a short trip our stay at the Patricia Grand was very pleasant. Checking in was quick and easy. Parking was easy. Food at the 2nd floor restaurant was good. Grounds were clean. We felt safe. Lighting around the hotel was very good. Easy access to the beach. Elevators were quick. Hotel staff was very friendly. Checking out was quick. We will definitely be back. Thank you for fulfilling our needs to make our trip great! Hotel staff courteous and professional. Accommodations were pristine. Rooms, pools, and lobby areas are very well maintained and clean. Pet friendly hotel. Great experience and worry free atmosphere made for a terrific and relaxing vacation! Loved it. Very Relaxing. Clean. Hotel staff was very nice. Lobby and public areas were very clean. Restaurant staff and bar staff were wonderful. Front desk very personable. Line to check in went quickly. Unit 1504 very nice!!! Parking across the street accommodated my SUV. Right on the beach. Great beach access. In the middle of all of the action, but very quiet and relaxing. It is high tourist season in Myrtle and I just wanted to spend some time with my daughter, who happens to be a resident of the area. It was inconvenient to stay with her so we booked with the Patricia. They were extremely accommodating and friendly. We were able to get a parking pass for my daughter so she could spend a little beach time with us. It was close enough to enjoy all of the attractions and yet far enough away for a little peace. (besides the 11:00 pm visit of a military Osprey, Kind of felt like we were in the filming of a True Lies movie) But that was the fault of the Patricia Grand. The room was just enough. Pretty perfect for what we needed. By the end of the week we were fondly calling it the Patty G.